Cocos island offers the diver big animals, open ocean, advanced diving. Howard Hall's film "Island of the Sharks" was filmed here. The main attraction here is sharks. 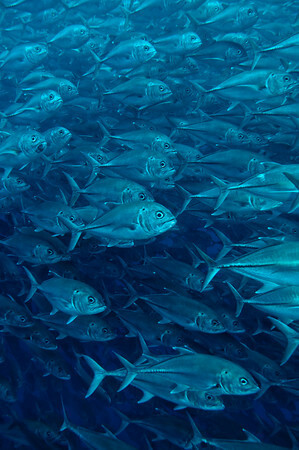 Cocos island is not a place with pretty corals or reefs. The bottom is a sloping rocky substrate without a lot of color. What you do get is amazing marine life - hammerhead sharks, other shark species and huge schools of fish. If you are comfortable with deep (100ft) nitrox diving in open oceans, and the possibility of swell, strong currents and low vis, Cocos island can be the apex dive trip of your dive career. It is not a place for non-divers. Cocos island is quite a beautiful island to look at topside, and short excursions to the island are possible, but you are on the boat almost all of the time. The island is lush and green with rainforest and waterfalls. 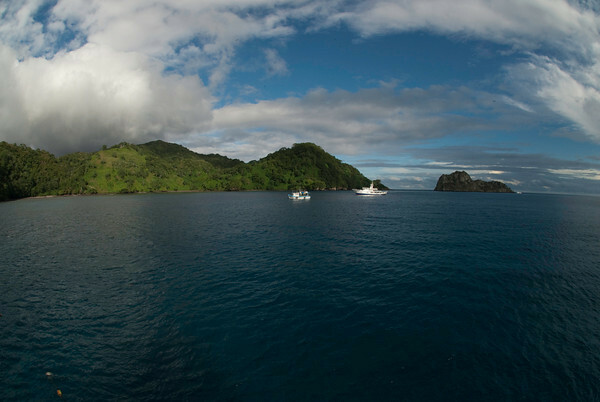 Malpelo island is another destination that Cocos liveaboards sometimes visit during the same trip. It is not that attractive and you can not go ashore. On a typical dive, you drop down as a group to a depth of 100ft , spread out and find a rock to hide behind. You then look for a cleaning station for hammerhead sharks, which is often a larger rock with many angelfish and butterflyfish around it. 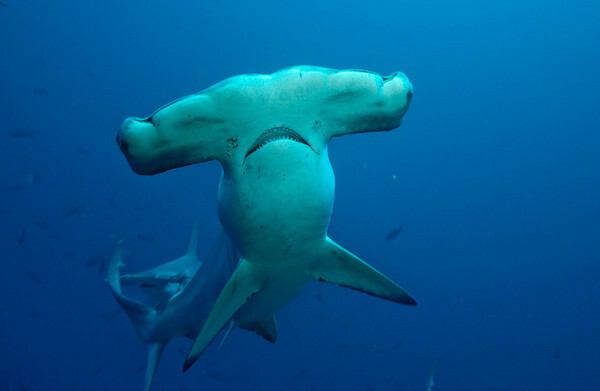 Hammerhead sharks are easily spooked by erratic divers' flailing limbs and exhaust bubbles. Attempting to approach these sharks usually only leads to their quick retreat. In order to get a chance at a close approach, enabling opportunities for good photographs, quickly and carefully locating a suitable rock to hide behind and controlling your buoyancy and breathing is essential. We were advised to become "blue" divers; (holding your breath when the sharks approach). I was able to get photographs that I had been told were impossible to get on open-circuit scuba, after learning to follow the divemaster's directions, calming down, being patient and ready to shoot when the action started. After a few dives like this, I had a number of very close passes by the hammers that allowed me to shoot at a distance of 2 or 3 feet. 3 dives a day were the norm at Cocos, with occassional night dives. 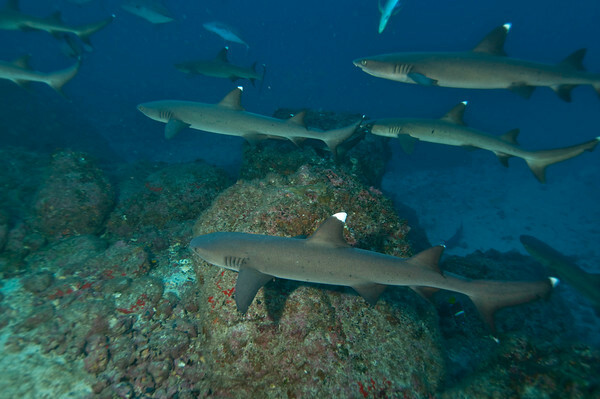 On several days a night dive will be offered with white-tipped reef sharks. Divers's lights illuminating the fish causes a feeding frenzy with the sharks. Any fish or turtle illuminated by a dive light will be quickly assasinated by several sharks, and because of this, some divers may not enjoy this dive or choose not to do it. On a remote trip like this, you need to pay attention to your depth & time, and follow the divemaster's instructions carefully. Being a very remote location, if you get lost at sea, your chances of being found are slim. There are no helicopters available if you get bent. 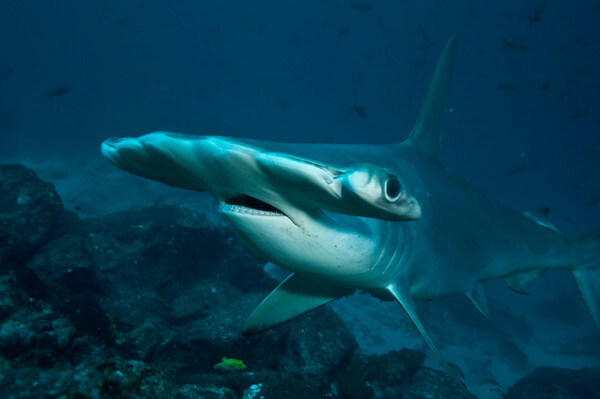 Hammerhead sharks are drawn to Cocos islands to be cleaned by King angelfish and , butterflyfish and other small fish. These islands are basically giant cleaning stations. Dozens of white-tip sharks are usually seen on every dive at all depths, cruising around the rocks. 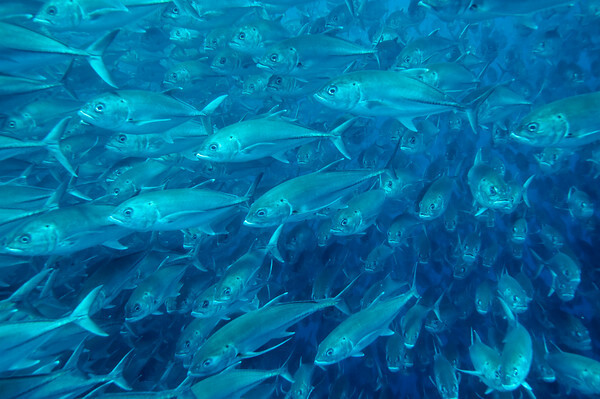 Enormous schools of bigeyed jacks, barracuda, snappers and grunts are seen on many dives, and the size of these schools must be seen in person to appreciate. Marbled rays are very frequently seen in groups of 5-20, feeding on the bottom at 100ft . Marbled rays are easy to approach and are always cruising around like they are on a parade. Whale sharks occasionally pass through, and there are often a couple sightings on a trip. Large tuna, mantas, silvertip sharks and eagle rays are often seen. Orcas, tiger sharks, dolphins, and sailfish are also seen but not on every trip. Divers have seen dolphins hunting jacks. 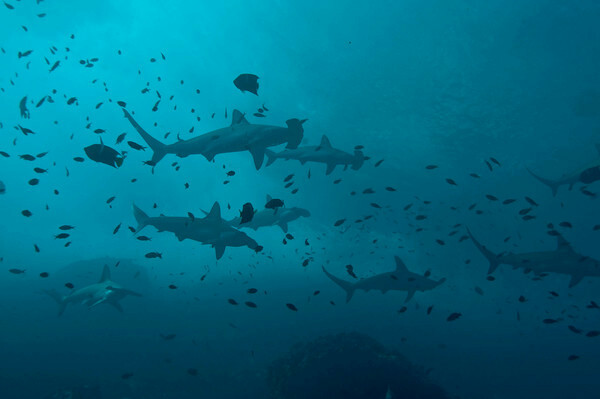 Galapagos sharks, which can be aggressive, are not as common, but do sometimes appear. 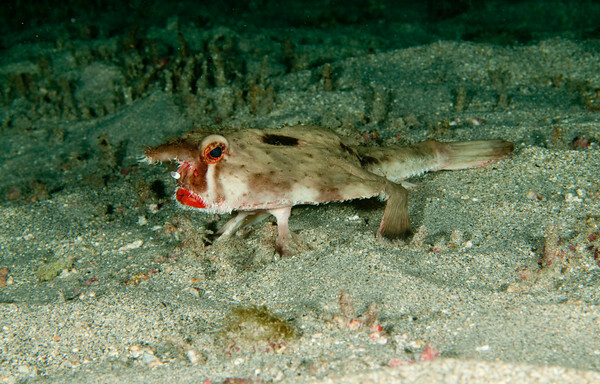 Usually 1-2 macro dives are done where batfish and frogfish are photographed at 70ft depth. 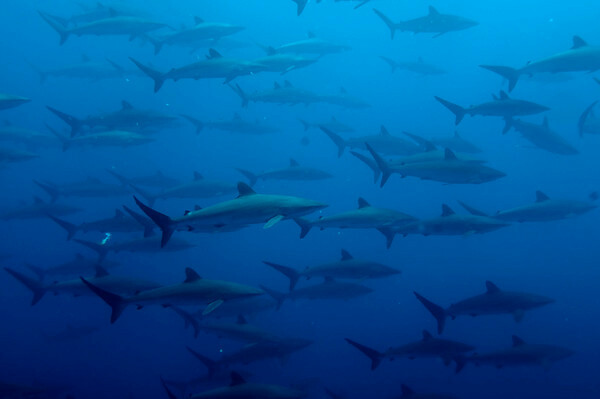 Malpelo Island is best known for large schools of silky sharks swimming at 20-50ft depth. 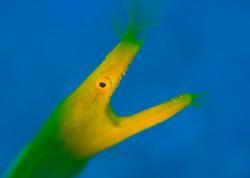 Large green moray eels out in the open, 4-6ft long are seen all over in Malpelo and are quite a sight. 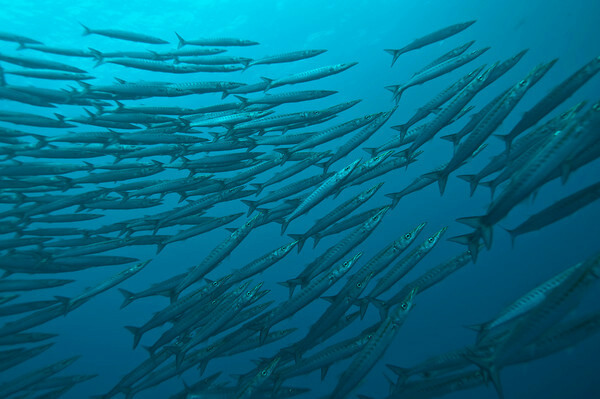 For more detailed info, check out our Malpelo Dive Destination article. Cocos island has a rainy season and a dry season. 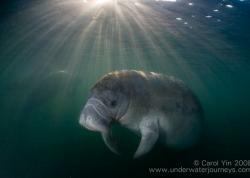 If you visit the islands in June/July, you have a chance of having both big animal encounters and calm seas. Dry season is Dec - May, which can bring Silky sharks and Mobulas, and smoother crossings. 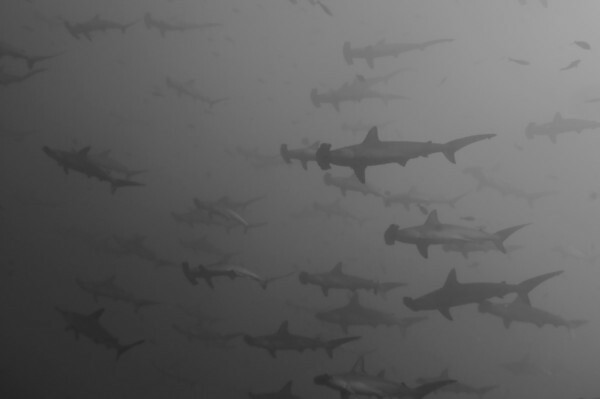 Rainy Season is June - Nov, and crossings can be rough, there's a lot of rain, but Hammerhead sharks are in larger numbers. Still, you will see hammerheads throughout the year. These times are also the best time to dive Malpelo island. May - Aug are probably the best months to go, but sightings/conditions can be highly variable. Note that hammerhead sharks sometimes go deep during an "El Nino" year. June/July, the water was 81 degrees at all depths. It stays from 80-82 during the summer. The water can get much colder, down in the lower 70's in the winter. Thermoclines are common, and down deep can even get into the 60's. In June, July the visibility was 50-70ft. Visibility can be variable but 30-50ft is the norm, with even better visibility from Jan - May. Liveaboards are your only option. Liveaboards depart from Puntarenas, Costa Rica. The boat will pick you up from San Jose. Travel time is approximately 40 hours to Cocos, 43 to Malpelo, and 40 hours from Cocos to Malpelo. At certain times of the year the crossing can be very rough with big swells and seasick passengers. It is necessary to dive Cocos on nitrox with a nitrox computer, since most dives are at 100ft. Divers on air will not be able to do all the dives and will be out of sync with the rest of the group, often surfacing alone. Having good control of your breathing and buoyancy is essential, and many divers will hold their breath as they get close to sharks to avoid spooking them. You will want to be very self-sufficient, with all of your own chargers, backups, etc. Most photographers bring multiple external drives with a laptop and spend some of the open ocean cruising, working on their images. Be sure to have backups for dive gear as well as computer and photo gear. Strobes are only needed when a subject is within 4-5ft of you. Turn them off or pull them behind you for subjects further away than 5ft. When using your strobes, you must be careful to avoid backscatter and blowing out the highlights of the shark's ventral side. 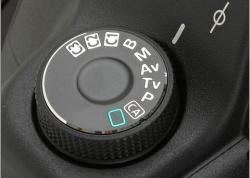 Careful strobe placement and use of low strobe power settings will enhance the quality of your images. If there is any doubt that your strobes will properly light your subject, turn them off since there is a good chance the backscatter can ruin your photo. The main draw here is big animals and pelagics. 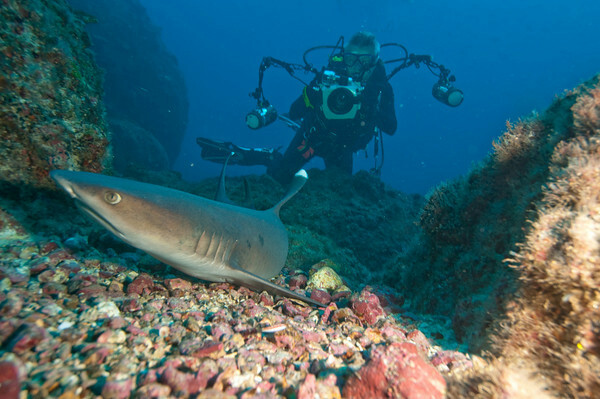 A 12-24mm zoom lens will give the best results, as sharks can be a little skittish. Jacks, barracudas and silky sharks can be approached closely, so a fisheye lens like a tokina 10-17mm can also give great results. For shark portraits, a mid-range zoom like a 17-35mm, 17-55mm or 17-70mm lens can be used. These focal lengths are for cropped-sensor cameras so if you are shooting full-frame make the proper adjustments.